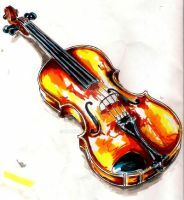 Hey, would it be possible for me to use this as a background on a youtube video of a violin song I assembled please? I'll give you props of course. I would love to buy this and hang it on my wall when I have the money, if your resource providers don't have any rules against you profiting. Excellent work. Wow you reminded me the Kamelot's wallpaper - Ghost Opera . They used the same girl I think . Great work !!! I love the colours and the concept. Oh wow. Gorgeous. I really like this. Oh wow! I'd love to have that as my background! Good job on it! It looks similar to an album cover of one of my favorite bands. just wonderful! keep it up! Wow! This one is great.. such emotions! you have been featured here! [link] Thanks providing the Devart world with such beautiful work! Its a very beautiful and powerful deviation. Wow! This is great! abulous work... Thank you for making my stock a part of your artwork!